Villa Carton Kitchen - where storage & play collide! Villa Carton Kitchen – where storage & play collide! If you need something to keep the kids amused for a few hours, a Villa Carton kitchen is your answer. Kids can easily spend an afternoon constructing it, colouring it, playing with it and when that’s all said and done, they can pack up all their bits and bobs and store within it. Yep, Villa Carton you’re a tidy chef’s dream come true! 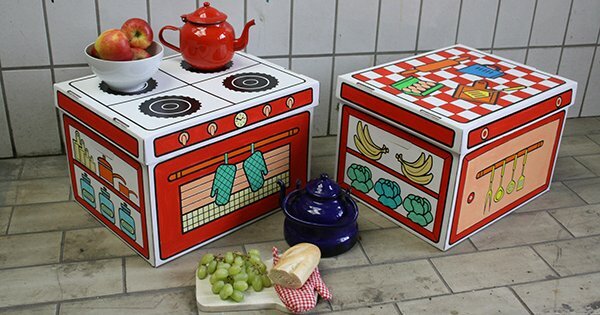 I’ve mentioned before my youngest child’s love for all things cardboard, with a particular obsession with boxes so I know, these beauties from Villa Carton will be right up his alley. It’s lovely to watch your child’s imagination develop and creative play is always an awesome outlet to build that sense. There’s lots of fun to be had with Villa Carton Kitchen Storage Boxes, expect some of your own kitchen items to go missing as your little ones set about creating a Masterchef moment with some pretend food prep and cooking. Better yet, the Villa Carton Storage Boxes can store all of that pretend food and kitchen gear when play is done. 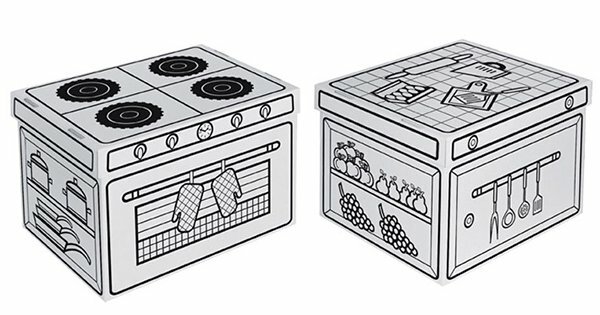 Villa Carton Kitchen Storage Boxes are sized 45cm x 35cm x 29cm, come in a set of two and are priced $14.95, available from Cheekie Lil’ Monkie.